When Novak Djokovic won the US Open for a third time on Sunday, he regained his place as his sport's biggest ever on-court earner. In total Federer has won 98 career titles, dwarfing Djokovic's tally of 71. In terms of money earned solely from ATP singles and doubles matches, Federer had won £90.1m ($117,507,812) going into the US Open - slightly ahead of Djokovic's total of £89.2m ($115,310,890). 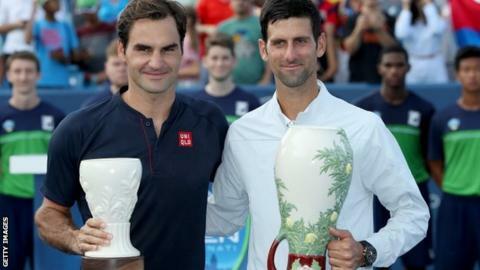 Going out in the last 16 put another £205,000 ($266,000) into Federer's account and, with £2.94m ($3.8m) going to the men's champion at Flushing Meadows, Djokovic moved back above him for only a second time with victory over 2009 champion Del Potro on Sunday. "Federer might have been doing it for over 20 years but Djokovic's peak has been so recent when the prize has gotten so big," explains Kurt Badenhausen, senior editor at Forbes magazine. So with Djokovic having won fewer Grand Slams - the biggest earner for any tennis player - and fewer ATP Tour titles, how has he managed to take home more cash? The Grand Slams and ATP Tour have grown considerably in terms of global popularity, appeal and reach - and therefore money - over the past decade. "The players have played a key role in driving that growth," ATP spokesman Simon Higson said. While the Slams continue to provide the biggest pay days for the world's best players, the growth of the ATP Tour has also been key to Djokovic and Federer breaking the £100m figure. Djokovic was the first player to pass that mark in 2016, with Federer then overtaking him thanks to his renaissance as the Serb's form slumped. An all-time record 4.7m fans watched ATP tournaments in 2017. And as audiences have increased, so have player earnings; ATP prize money - for tournaments excluding the Slams - has risen by 286% over the past three decades. Inflation over the same period is 92.8%. No wonder the 'Big Four' of Federer, Djokovic, Nadal and Britain's Andy Murray are the top-earning players of all-time. In addition, players such as Spain's David Ferrer and Czech Tomas Berdych, both mainstays in the world top 10 for years without winning a Grand Slam, have earned comparable amounts to global mega-stars of the previous era in Andre Agassi and Boris Becker. Serena Williams, who lost to Naomi Osaka in Saturday's women's final when going for a record-equalling 24th Grand Slam title, has earned far less than Djokovic and Federer. Before this tournament, the 36-year-old American had earned £66m ($86m) in prize money over her illustrious career - more than double that of older sister Venus, who is second on the list of all-time female earners. Although parity was eventually achieved at Wimbledon when both singles' champions were given the same winning cheque in 2007, the WTA Tour's overall prize money still trails that of the ATP. While Djokovic might be competing toe-to-toe with Federer on the tennis court, both physically and financially, he is nowhere near matching the Swiss' overall wealth. Federer is the 15th-richest sports person in history, having earned £522m ($675m) over his 20-year career. In 2017, his total income was £59.5m ($77m) - £50.3m ($65m) through endorsements and £9.2m ($12m) in prize money. By contrast, Djokovic has an overall wealth of £135.4m ($175m) and brought in £18.2m ($23.5m) - £17m ($22m) through endorsements and £1.2m ($1.5m) in prize money - last year. "Federer's endorsement portfolio is unparalleled across all the sports," explains Kurt Badenhausen, a senior editor at Forbes magazine specialising in the business of sport. "And many of these deals have struck out for 10-plus years." Why is Federer more attractive to sponsors than Djokovic? "He has got a few things going for him," Badenhausen says. "One, he plays a global sport. Two, he's been at the top of his game for a very long time. Three, the demographics of tennis are incredible in terms of disposable incomes and people who are ready to spend money on watches, cars and equipment. "That's why you have marketers banging down doors to get into business with Roger Federer." This has been illustrated by the Swiss, who has refused to acknowledge the word 'retirement' but knows the end is not far away, signing a 10-year deal with Japanese clothing company Uniqlo - worth £232m ($300m) - after his contract with long-time backers Nike expired. "Nike has traditionally paid top dollar for athletes that are still performing and still competing, but as those athletes moving towards retirement it is not necessarily willing to commit significant resources to those athletes," Badenhausen explains. One would imagine more time would be devoted to the Roger Federer Foundation, which supports educational projects in Africa and Switzerland, along with a management company - set up alongside his long-time agent Tony Godsick in 2013 - that boasts Del Potro and Grigor Dimitrov in its ranks. "To some degree Federer leaving Nike sent shockwaves after 20-plus years together, but as he moves into the next phase of his life it makes sense," Badenhausen says. "Federer's popularity in Asia is off the charts so he looked at it as an opportunity where he can connect with his fans. "With the Olympics in Tokyo in 2020 and Uniqlo being a big backer that could present a lot of synergy for Federer." "His home country certainly has an impact, he is not going to get any deals from there," he says. "Federer has a lot of global deals but also has several very lucrative deals from big Swiss companies. That isn't an option for Djokovic in Serbia. "Also Djokovic has bounced around from one apparel brand to another. That has hurt him, without those brands breaking through. "Federer has always had Nike at his back, marketing Federer around the world - and there is something to be said for the power of Nike. "They have a long history of creating these personas that are bigger than life. "They did it with LeBron James, Tiger Woods, Michael Jordan and in tennis with John McEnroe, who wasn't the most successful of his generation but he was the biggest player of his generation because of the way Nike marketed him as the bad boy of tennis. "Nike always pushed Federer as this graceful champion of the sport. Djokovic hasn't had that backing."